I developed iOS app, and I uploaded binary of my app on 19th August 2013. 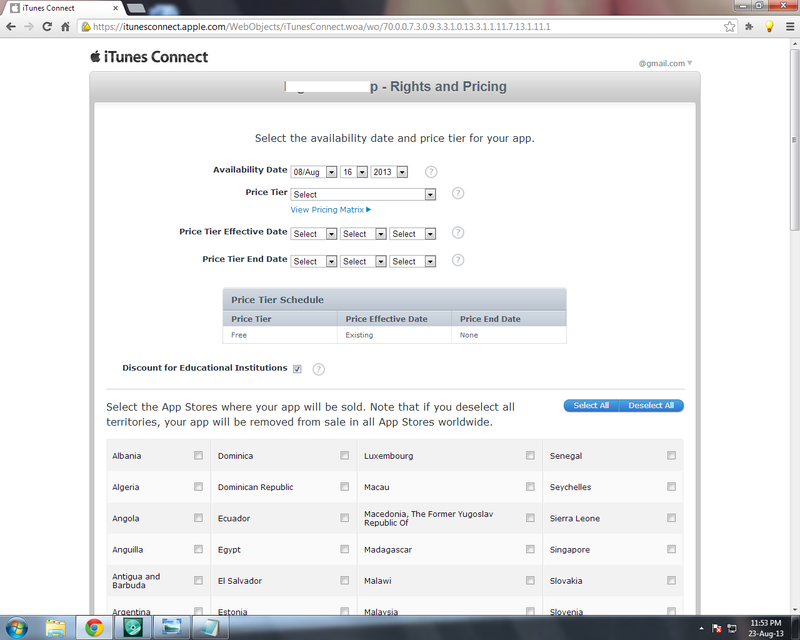 Here is screenshot of my rights and pricing section from my iTunes Connect account. How should I live my app in app store or it will be automatically live in the store ? I might be wrong, can't remember connect that well, been a few months since I last published an app. Lastly it might take about 24 hours for the app to propagate to all app stores. Check again tomorrow on the store. Your release date does look in order since it is a historic date. Go back into app description, and make a simple edit. Save it. Two minutes later it will be ready for sale. Make sure to check the status of your agreements. If the agreement status is Pending Contract, you may have to agree to the PLA or Paid Applications agreement or complete the associated bank and tax information for that agreement. Make sure the availability date provided in the Rights and Pricing section is prior to today's date. If the date provided in the Rights and Pricing section is in the past, make sure you made your app available in at least one App Store territory. If your app was scheduled to go live within the last 24 hours, the app may still be updating in the App Store cache. Once the 24-hour caching window has passed, close and open iTunes and search for your app again. You can also click View in the App Store from the More tab on your app's page in My Apps. If you have checked the factors above and the app is still not on the App Store, contact us. Not the answer you're looking for? Browse other questions tagged iphone ios ipad app-store itunesconnect or ask your own question.